Welcome to The Culture Cook! There are only so many things you can do with beef mince. 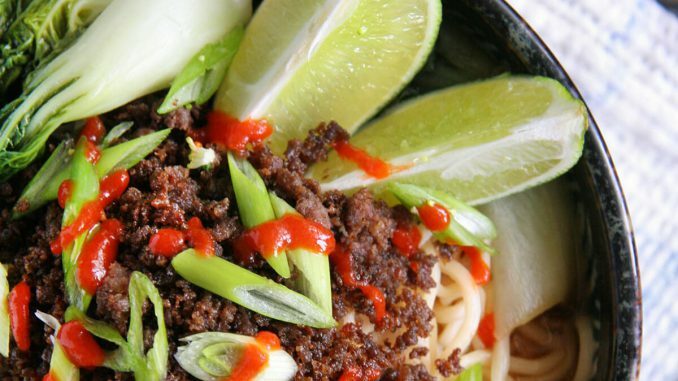 I never thought I can get these Asian flavors from mince. This is a beautiful mid week meal for the whole family. It’s fast and super easy. Lightly toast the peanuts in a dry frying pan, then crush in a pestle and mortar and put aside. Peel and finely chop the garlic and ginger. Put 1 tablespoon of sesame oil and the star anise into the frying pan on a medium-high heat. Add the mince, breaking it apart with a wooden spoon, followed by half the garlic and ginger and all the honey. Stir-fry for 5 minutes or more to crisp up and get golden brown. Must be nice and crisp! Meanwhile, crush the remaining garlic and ginger into a paste in the pestle and mortar, then add in the fish and soy sauces and lime juice to make a dressing. Cook the noodles according to the packet instructions. Trim the spring onions, then finely slice with the chilli (deseed if you like). Prep the salad veg, breaking the lettuce leaves apart and matchsticking or finely slicing any crunchy veg. Load up your plates with that lovely salad veg, then drain and add the noodles. 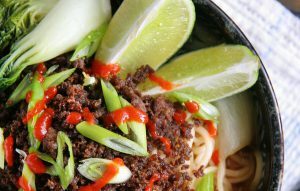 Spoon over the dressing, sprinkle over the crispy beef, chilli, spring onions and crushed peanuts, pick over the coriander leaves and tuck in. I am just a guy that loves good food :) Yes, and traveling. Oh yes, and wine. Good wine. Travel with me all over the world and we'll taste and drink everything! I am The Culture Cook, because I love travelling and enjoy experiencing a country through food and drink. I have been fortunate to be able to travel all over the world and I decided that I would like to share all these wonderful dishes that I have experienced. Only the most tasty, perfect, tried-and-tested recipes will make it onto these pages. The food websites out there have tens of thousands of recipes but 90% of them are crap. That’s my personal experience. I will share with you only the best recipes (in my opinion obviously) that I have tried myself. I hope you enjoy these great recipes with me. Please don’t hesitate to send your favourite recipes to me and to comment on any of the posts I make.